Here is my current work in progress-or at least one of them! 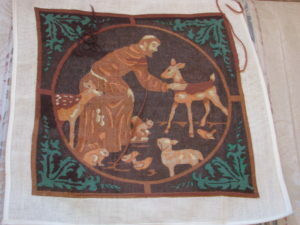 It is St. Francis of Assisi by Elsa Williams and is needlepoint. It is one of several kits I purchased at a rummage sale years ago that someone else started and I decided to finish them. I have to do some modification, however-Jackie Jo was being naughty and chewed a hole in the canvas, so now I have to splice in a piece to complete it. Bad kitten!